Just like the Canadian crossing miles of Saskatchewan prairie, the track looks clear ahead. Offers of assistance, expressions of support, and a generally increasing level of interest appear as this project hurtles along. 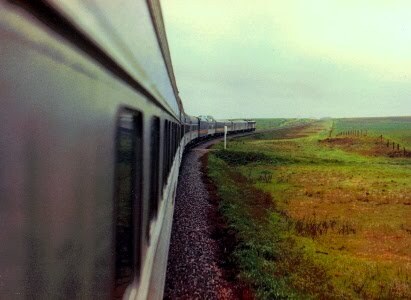 One thing is clear: VIAphiles, as I'm calling those who share my interest in VIA Rail, represent all eras of VIA. This is something I'll bring to the book. It's not enough to proclaim, "These were the trains of the glory years of VIA...", because this is a question of perception. It seems fair to include all parts of VIA's sometimes tumultuous past, from its inception to the present. Thanks to all who've expressed interest in this project, along with their unique viewpoints. Just today I've put together my first draft page. Highball.